Max Verstappen cruised to his fifth victory in a Formula One car while Lewis Hamilton claimed his fifth world title, the British driver’s fourth-place finish enough to see him crowned champion with two races to go. 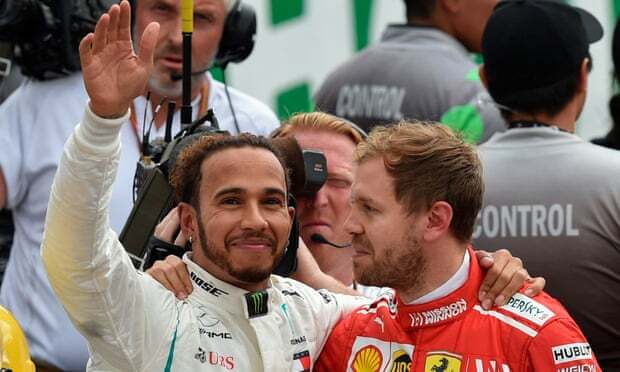 Hamilton became only the third driver ever, behind Juan Manuel Fangio and Michael Schumacher, to claim five world championships. Verstappen’s win was arguably the most polished of his career; he was incisive off the line to pip his pole-sitting teammate Daniel Ricciardo and the Flying Dutchman never looked back. Verstappen immediately put in quick laps to open up a gap from the chasing Hamilton. But tyres were clearly going to play a big role in this race, and Hamilton’s ultrasofts were looking angry by the time he became the first of the front-runners to pit on lap 12, Mercedes double-stacking Hamilton and Valtteri Bottas and giving both drivers supersofts. Ricciardo and Verstappen followed suit. 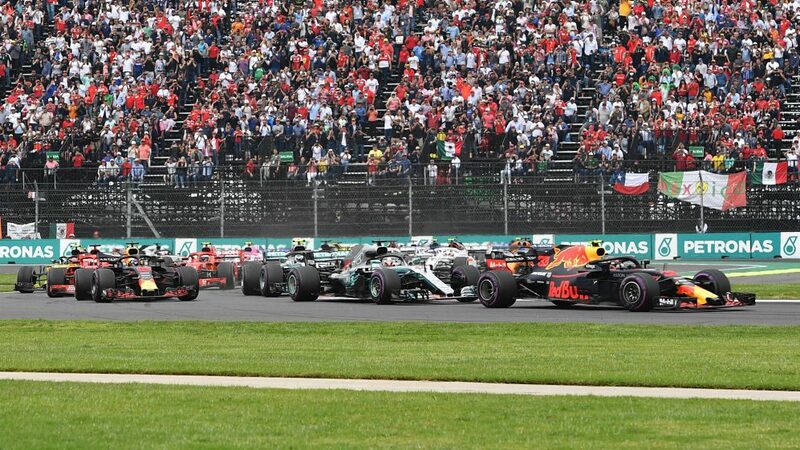 As the race settled into its rhythm, Verstappen pulled away from Hamilton as Vettel went after Ricciardo’s third place. Vettel firmly shouldered his way through into the first turn to claim third on lap 34. After the second stint of stops came the confrontation that everyone had been waiting for, as Vettel closed in on Hamilton in P3. There was some great wheel-to-wheel racing between two fine champions with Vettel DRS-ing past Hamilton and then holding fast to take third place yet again. Hamilton, despite knowing that a top-seven finish would be enough to take the championship, endured an unhappy race, relaying a series of edgy messages back to his team about everything from his tyres to his lack of interest in Kimi Raikkonen’s current position, his pace nowhere near that of the Red Bulls and Ferraris ahead as he struggled with gaining throughout. Vettel knew that his chances of staying in the title hunt were minimal coming into the race. Despite putting in a fine performance, finishing second, it wasn’t enough to deny Hamilton. The German inherited that second place after Ricciardo suffered his eighth DNF of the season; his engine appeared to let go on lap 62, a cruel twist of fate for the Australian. Verstappen romped home to the fifth win of his career with Vettel in second, joined on the podium by his teammate Raikkonen. The Finn had a mostly quiet afternoon but did enough to deny Hamilton a podium finish on his momentous title-winning day. 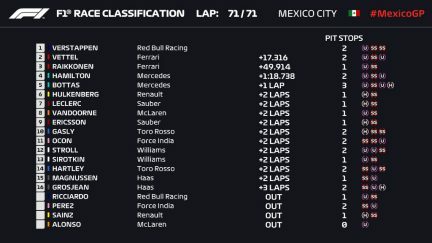 That left the Mercedes boys to finish fourth and fifth, Hamilton ahead of Bottas, with Hamilton massively dropping his pace towards the race end to make it home safely and claim the championship. And though Vettel had arguably been the better driver on the day, there was no way for the German to hide his dejection as he stood being interviewed following yet another championship bid going up in smoke.